What is important to bear in mind when selecting rings? Your wedding ring is something that you’ll want to wear for the rest of your life, so it has to have the wow factor. Whether you want a traditional band or something more individual, it is important that a ring complements the bride’s engagement ring and suits a couple’s personal style. That said, you’re free to mix and match. If you prefer platinum and your partner likes yellow gold, that’s fine. There’s no rule that says you both have to have the same metal or style. All that matters is that you both love the rings you choose. How important is the choice of metal? The choice of precious metal for the bride’s ring should be the same as her engagement ring. Precious metals vary in hardness, if you put a harder metal next to a soft metal, the harder metal will wear away the softer metal. As the groom usually wears the wedding ring on its own, any of the precious metals can be used. Platinum rings are becoming increasingly popular with modern couples as it offers a lifetime of maintenance-free wear, as does palladium, which looks very much like platinum but is available at a lower cost. White gold rings are usually rhodium-plated which dulls over time, so the cost of maintenance is something you should consider when selecting your wedding ring metal. Engraving on the inside and outside of the ring is very popular. Colin naturally has a great love of diamonds, and his biggest advice is to ‘sparkle on’. 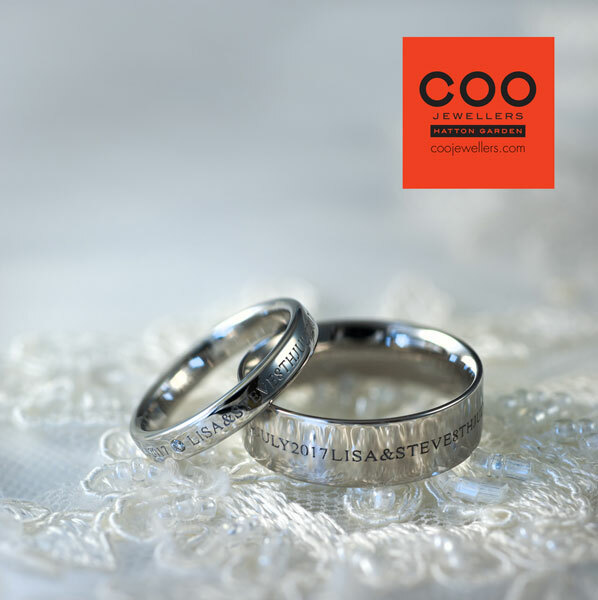 Most couples choose to have bespoke wedding rings made, as this way they get to have some input in the designs and it feels more personal than choosing a mass-produced ring. If you take this option, you should always allow at least eight to 12 weeks for bespoke rings to be made so they’re ready in time for the big day. Ordering well ahead of time could also save money, as you can avoid the rising gold and platinum prices. Should it be a surprise or should couples buy rings together? Buy your wedding rings together. Being given an engagement ring is a nice surprise, but choosing the right wedding band is much more fun to do together. 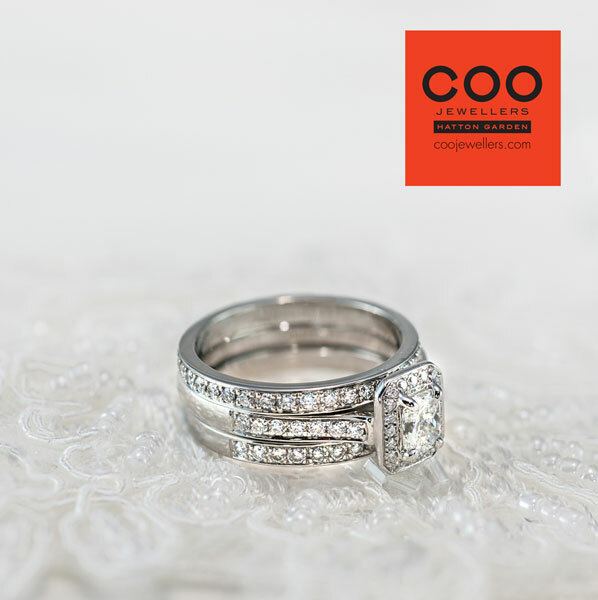 Talking to a specialist wedding ring jeweller will be helpful, as their years of experience will help you choose a band that complements your engagement ring. They’ll also have hundreds of rings you can try on, so you can be guaranteed to find the perfect fit for you. Engraving your rings really adds the personal touch. 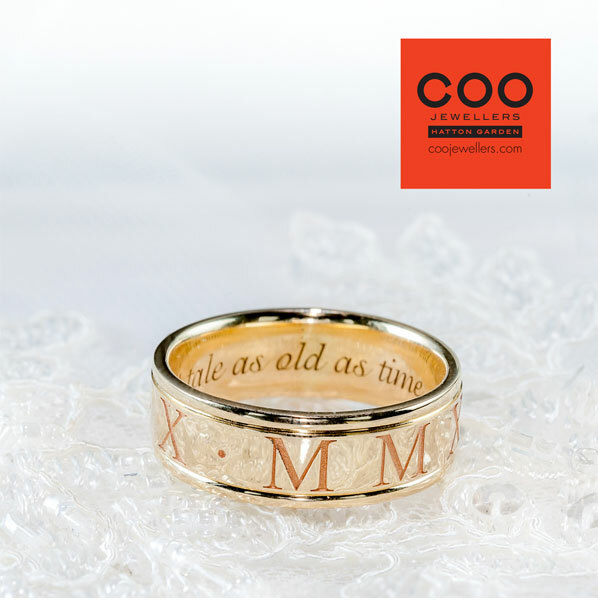 You can add your wedding date and names or a personal message. You can even keep these secret (which means your partner won’t see the message until the day. Laser engraving is the clearest method of engraving; it costs a little more than traditional etching but is well worth it. Bespoke rings are particularly beautiful and personal. 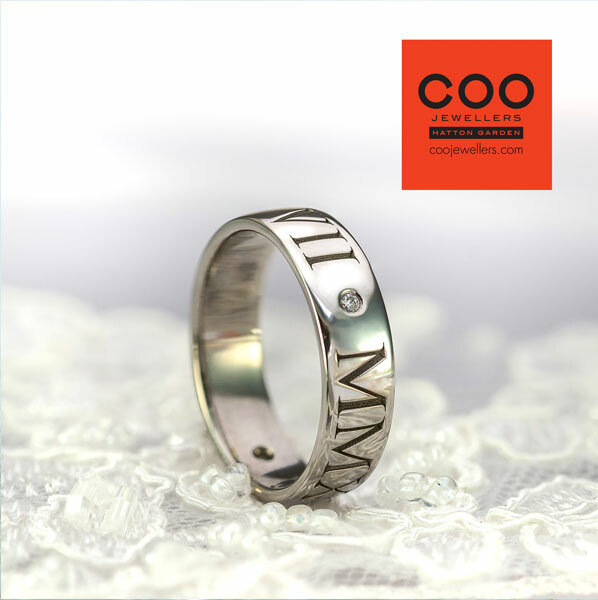 Roman numerals are often used when engraving rings. Does it have to be a ‘forever’ decision? Wedding rings are for the long haul. While you shouldn’t be afraid of picking the ring design you like right now, just remember you’ll want something timeless that’ll still look fabulous through your silver, ruby and gold anniversaries! Nonetheless, if you feel you like your ring finger needs an upgrade in the future, that’s OK. After all, you married the person, not the ring. In your experience, what looks particularly great? Diamonds, diamonds and more diamonds! If you add a vintage feel, you could be on to a winner. It is important to keep them clean though, and looking their best. You can keep yours gleaming by placing your ring in hot soapy water – an egg cup is fine – overnight. In the morning, brush the diamonds with a baby soft toothbrush which will remove lotions and hand cream. Rinse under warm water and dry it before popping it back on. Enjoy choosing your wedding rings! This is a wonderful experience to share with the one you love. 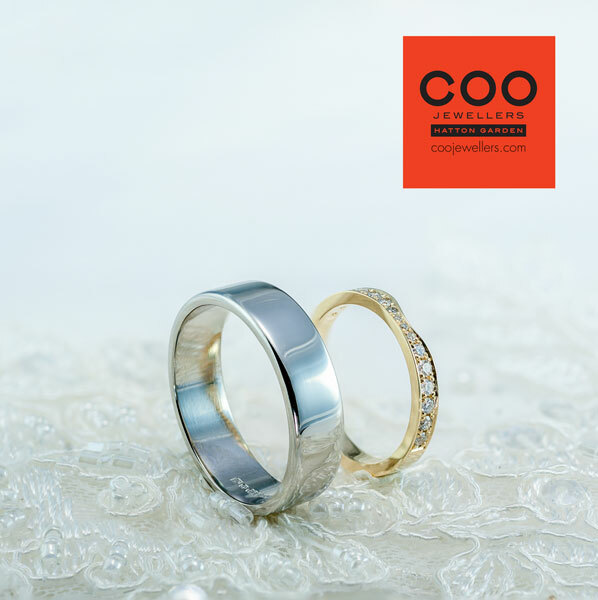 COO Jewellers is located at 14 Greville Street, Hatton Garden, London EC1N 8SB (Tel: 020 7404 0757) and at Martels Wedding Village, High Easter Road, Barnston, Dunmow, Essex CM6 1NA (Tel: 01245 263950). 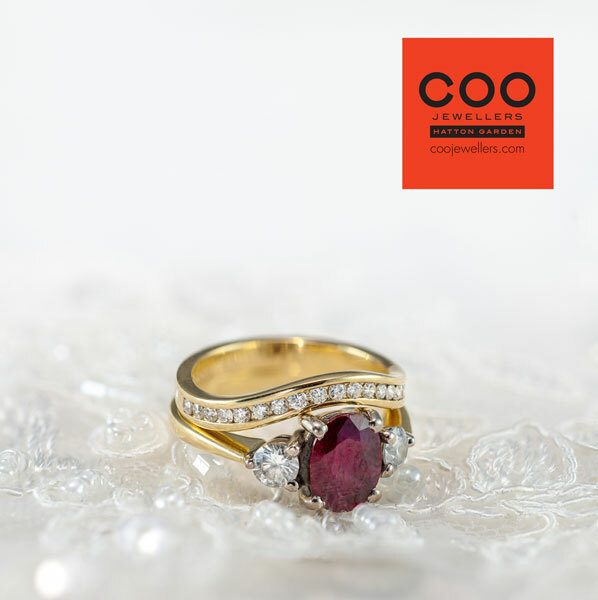 Visit www.coojewellers.com or follow @coojewellers on Instagram for further information. Looking for more advice on planning your special day? Contact me here.